The big news came just before the game: Colm 'Gooch' Copper, a man in the autumn of his career, would stay in his tracksuit even though he was named in the starting XV. Half the crowd in Austin Stack Park for the Kerry county final were considering making their way to the cashier for a refund. The day was pitch-perfect for Gooch football. The windmills beyond the back wall on the Stack's Mountains were barely turning over. The national grid didn't boil too many wind-powered kettles for hot-water bottles last night. If Gooch didn't start, well then he must be in bad way - so they were saying. And we waited to see if he would come on. After all, this was the Kerry county final. This kind of game is the reason he keeps going. Cooper's beloved Dr Crokes of Killarney were on the verge of history, a 13th county win and a spot atop the Kerry roll of honour - one above Tralee's Austin Stacks, their great rivals - was within their grasp. David Shaw replaced the Gooch. No pressure, son. He kicked three superb points. The Gooch cheered every score. Club first, me next. That's the Crokes way. It was unlikely anyone would leave early after the events of Red October. There were incidents that would have ended up before the courts if the events happened outside the curtilage of the GAA grounds. Punches can kill in these days of body-building. You would never meet a son now who is smaller than his father. The referee Seamus Mulvihill could have given a couple of harsh reds but he kept calm after a very violent autumn of club football. Mulvihill has perfected a kind of whistling language similar to that of the natives of the mountains of Gran Canaria. His shrill blows worked. The game was clean for the most part. The Gooch came on early in the second half. He tracked back most of the length of the field and was as free of bandages as Tutankhamun before he met the undertaker. I would say the decision not to start him was tactical. It wasn't so much what the Gooch did when he came on as the effect he had on those around him. His marker Aodhán Ó Conchúir stuck so close but he was very clean and kept Gooch scoreless. If you ask any of the younger lads in Kerry who was the greatest of them all, they will invariably say "the Gooch" with the sort of 'the aul lad is losing it, what are you asking me that for' face. Isn't the answer obvious? Half the players who play on him are dying to ask for an autograph. Having said that, he's not the force of old. Colm has the mileage up and the injuries add on more wear and tear. But he still trains hard. His friend and work colleague Stephen Stack describes him "as incredibly driven but in a quiet sort of way". It is unfair to compare the Gooch of today with the young Gooch. He plays for the love of the game and the club that made him, the club his brothers played for. Cooper can be marked out of games nowadays by top defenders but the brain still thinks faster than any other footballer in the land. He reads the game better than anyone who has ever played Gaelic football. Gooch still has the eye for three moves ahead. He just knows where the ball is going to be. Sometimes he drifts harmlessly to occupy what seems like an innocuous piece of waste-ground, far from the action, but the ball invariably finds him. Gaelic football is now at a stage when only a mother could love the game but both teams played with only one sweeper and there was some fine football played. These are the dark ages of Gaelic football and we need men to illuminate the manuscripts. Dublin and a few others play attractive football, but in a way Gooch is responsible for the mass defences. Why is he to blame? Because he was so good at winning one-on-ones, or two-on-ones. Club football could have been played in a cage this year. Maybe in the stillness somewhere by his home lakes, the Gooch may well say to himself: "Sure, they've been trying to nail me for years. and there wasn't a word about it." I look down at him now with about 10 minutes to go. He reminds me of a young kid just dying to get on the ball. Cooper is as up for this as any of his All-Irelands. 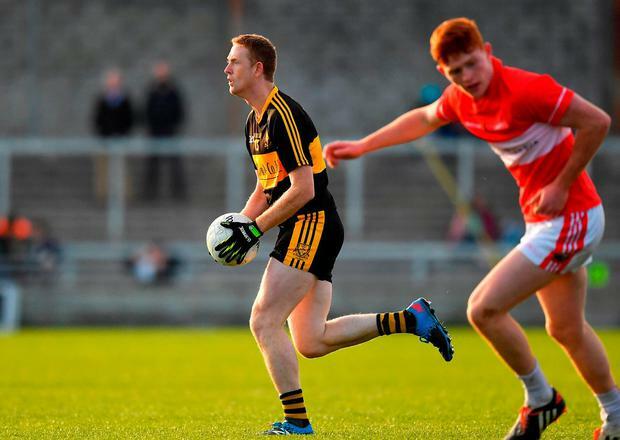 He will go joint top of the list for county final wins with team-mate Eoin Brosnan if Crokes hold on. That's eight. Dingle, believe it or not, haven't won a county title for 70 years. The Geaneys, Paul and Mikey, are kicking some great scores. The Gooch is outfought over at the far side. A huge cheer goes up from the terraces. But then he finds a little space, sends a short, quick pass. Crokes score, but they are getting nervy now and are giving away too many frees. Gooch goes back to the backs. He is a calming presence. He slips away to the shallow and give his backs easy outs. Then he slows up the game. He has a word. These are sensible rather than dramatic interventions. Crokes catch their breath. They break out for a superb goal after going the length of the field. One of the Crokes players goes down after an off-the-ball tackle. In goes The Gooch with a shoulder. He backs his own. The ref whistles and whistles. Gooch gets a yellow. That passion shows Cooper will keep on now for a while longer. And why shouldn't he? I ran in to him just after the game. He was waiting for the team bus. Yes, the Gooch still matters and the Gooch still counts. Mad for football, he is, and football is still mad for him.